I'll be starting this challenge tomorrow, September 1. (One more Wednesday and I'm there). Panic, panic, can't panic. Think of food. Think of sugar. I am a sugar cube in cold water. I won't dissolve. Precise edges. Made up of tiny, regular, secure parts. If the water were hotter I would worry, but it's cold. I stay together. Precise. Clean. Surrounded, but whole. Okay. I need to cook. It'll calm me down. Ginny's parents have died in a car crash and her sister, Amanda, wants/expects to put their family home up for sale. Shy, quirky Ginny is ill prepared to deal with her parents' death, let alone the probable loss of the only home she has ever known. Seeking comfort and a world she understands, Ginny retreats to the kitchen where, using recipes handwritten by those now dead, she not only creates memorable dishes, but also summons the spirits of the dead. These summonings eventually help Ginny to come to grips with her family's past and build her own future. I don't have to move into Amanda's house to be present in her family. Even though I'm not there physically all the time, I want them to have something that says, I'm out here. I'm okay. I love you. I want them to bite into a cookie, and think of me, and smile. Food is love. Food has power. I knew it in my mind, but now I know it in my heart. As we all know, I love foodie novels and The Kitchen Daughter is no exception. If you loved the magical realism of foodie lit like Like Water for Chocolate or Crescent, I think you'll really enjoy The Kitchen Daughter. I devoured this book in one sitting and then I read it again, slowly and savoringly, over the course of a week. Even now, days after finishing it, I crave more of Ginny's story. 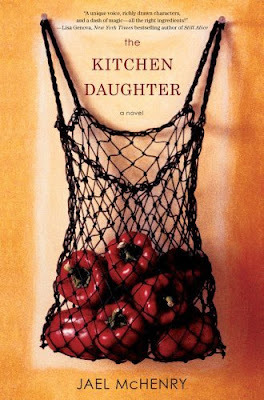 The Kitchen Daughter is one of the few novels I've read this year that demands a sequel. Or a movie. A movie would be acceptable! At the point where I learned what I was fighting, loving, I knew that I was bound, in the end, to lose. I dispensed with the formalities of tenderness, pity, the ceremonial flattery that should go before disciplined massacre. I fought, I suppose, like a woman, uttering distracting cries, making false moves, hitting below the belt. I was incapable of giving up, and unable to escape. But I was no match for Jake. He went on loving me even after I was beaten, propped up with my wound wide open, emptied of memory or hope. Mrs. Armitage (we never learn her personal name) has lots of kids, but she isn't really mother to any of them as the lifestyle she maintains with her current husband (number four, which is a bit of a big deal in 1950s England) means there are layers of carers between herself and the children. I get the feeling she resents those layers, but doesn't see away through them. This is the life her husband has built and it's supposed to be the life she wants. Maybe, having another baby would make things better? She does enjoy being pregnant. But does she enjoy being pregnant because it is the only time she feels in control of herself and at the center of things? 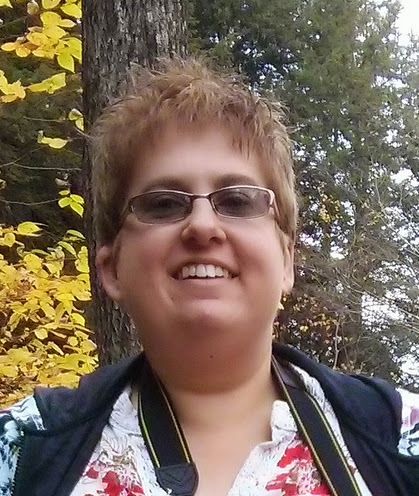 Her husband doesn't want more children and finally cajoles her into an abortion and sterilization. Mrs Armitage goes along with his desires, because she loves him and wants to keep her marriage together when it is obvious another pregnancy will wreck it. Of course, Mrs Armitage is understandably destroyed when she discovers her husband has been having an affair with a young married actress he works with and has gotten her pregnant. Is it any surprise she ends up hiding out from her husband and children in their glass tower of a country house? 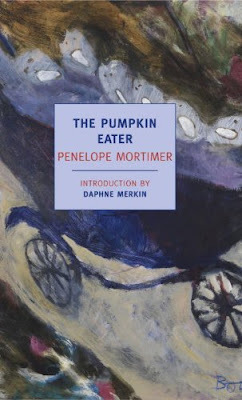 While I couldn't stop reading The Pumpkin Eater, I can't say I enjoyed it overmuch. There are darkly funny bits and some of the language is quite lyrical, but it's still a brutal story with sort of drab inevitability to it. Long before the children laid siege to the tower, I knew Mrs. Armitage would be conquered and reclaimed and that life would go on as before for her, sans fecundity.